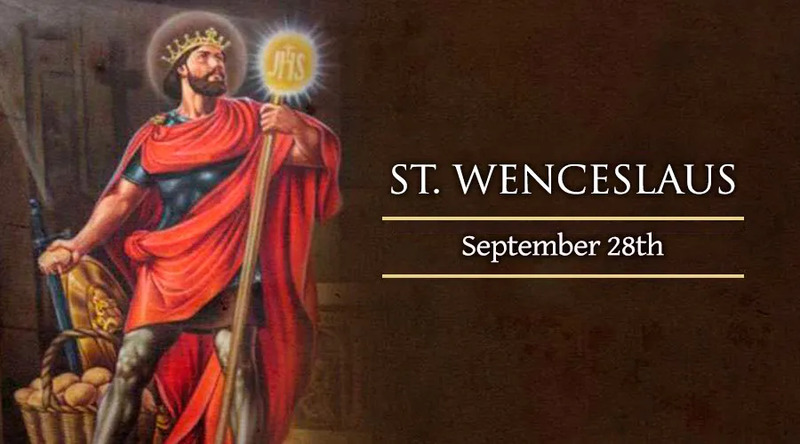 On Sept. 28, the Catholic Church honors Saint Wenceslaus, a Central European ruler who died at the hands of his brother while seeking to strengthen the Catholic faith in his native Bohemia. During his youth, Wenceslaus received a strong religious education from Ludmilla, in addition to the good example of his father. He maintained a virtuous manner of living while attending college near Prague, making significant progress both academically and spiritually. But with the death of his father Wratislaw, the devout young nobleman faced a spiritual and political crisis. His mother Dragomir, who had never accepted the Catholic faith, turned against it entirely. She seized her husband's death as a chance to destroy the religion his parents had received from Sts. Cyril and Methodius, through methods that included purging Catholics from public office, closing churches, and preventing all teaching of the faith. Dragomir's Catholic mother-in-law Ludmilla urged Wenceslaus to seize power from his mother and defend their faith. His attempt to do so resulted in the division of the country into two halves: one ruled by Wenceslaus, advised by Ludmilla; the other ruled by Wenceslaus' younger brother Boleslaus, who had absorbed his mother's hatred of the Church. Wenceslaus, who would have preferred to become a monk and not a duke, fortified himself in this struggle through fervent prayer, extreme asceticism, charitable service, and a vow of chastity. Meanwhile, his mother carried out a plot to kill Ludmilla, having her strangled in her private chapel. St. Ludmilla's liturgical feast day is Sept. 16. The Bohemian duke also faced the threat of invasion from abroad, when Prince Radislaus of Gurima demanded that Bohemia submit to his rule. When Wenceslaus sought to avoid a war by challenging him in single combat, two angels are said to have appeared, deflecting the javelin thrown at Wenceslaus and immediately inspiring Radislaus to drop to his knees in surrender. During his period of rule, Wenceslaus received the relics of several saints from the Holy Roman Emperor Otto I, who also conferred on him the title of “King Wenceslaus.” But some noblemen of his own country resented the saintly king's strict morals, and allied themselves with Dragomir and Boleslaus. Wenceslaus' brother sought to appear as a peacemaker, inviting the king to his realm for a celebration. When Wenceslaus was praying in a chapel during the visit, Boleslaus' henchmen attacked and wounded him. Boleslaus himself delivered the final blow, killing his brother by running him through with a lance. St. Wenceslaus died on Sept. 28, 935. Emperor Otto responded to St. Wenceslaus' death by invading Bohemia and making war against Boleslaus for several years. He succeeded in conquering the region, and forced Boleslaus to reverse the anti-Catholic measures he and his mother had taken. There is no evidence that Dragomir, who died soon after the murder of St. Wenceslaus, ever repented of killing her family members. Boleslaus, however, came to regret his sin when he learned of the miracles that were taking place at his brother's tomb. He moved St. Wenceslaus' body to a cathedral for veneration by the faithful.